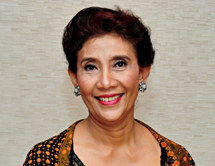 Susi Pudjiastuti, the Republic of Indonesia’s Minister of Marine Affairs, was appointed by President Joko Widodo in 2014. Minister Susi has aggressively protected her nation’s economic and environmental interests by targeting the multi-billion dollar pirate fishing operations of foreign fleets. She has courageously and audaciously led the blowing up and sinking of more than 200 illegal fishing boats caught poaching—a strong deterrent to organized crime efforts that have invaded and overfished Indonesia’s biologically rich waters for years. She has been instrumental in the freeing of slave crews held on many of these foreign vessels, and she’s led the freeing of illegally trapped whale sharks. Her work has proved vital to protecting Indonesia’s unique and world-famous marine ecosystem while also providing important economic benefits and sustaining the livelihoods of tens of thousands of domestic fishermen, their families and their communities.